Jennifer Urezzio is the founder of Soul Language and a master intuitive who uses her intuitive skills to help raise consciousness. Soul Language is a paradigm to put tangibility to Soul. She is the author of two books (available on Amazon): Soul Language Consciously Connecting To Your Soul for Success and A Little Book of Prayers. Jennifer Urezzio is a master intuitive, author, teacher and speaker. She specializes in helping people connect – to themselves, to each other, and to the Divine. She founded a new paradigm, Soul Language, which provides guidance for understanding our true nature and tools for accessing deeper levels of awareness. This new insight into how the Soul expresses itself is being embraced by top healers, lifestyle coaches, and CEOs all over the world as a method for helping people recognize their purpose and live from a place of power and truth. Following a stellar 30-year career in the consumer products manufacturing industry, Steve Smith converted his knowledge and experience into a successful business and executive coaching company. He established GrowthSource Coaching in 2008 in Orange County, CA.Steve instructs business clients worldwide and has served over 400 to date. His specialties in leadership, management and marketing make him an ideal coach to help professionals preparing to become world-class business owners or company executives. Dale Smith Thomas is a motivational speaker and author, and she has just released her second book, Good Morning Gorgeous. Already, her message has helped hundreds of women discover their inner “gorgeous.” In addition to her books, Dale is the president and founder of Winners By Choice, Inc., and she has worked with major corporations in every industry. Brian Basilico is an award-winning, internationally recognized author and speaker (and a self-professed geek). He’s the founder and president of B2b Interactive Marketing Inc., an award-winning marketing consulting and production company in Aurora, Illinois. B2b was founded in 2001 and helps companies and non-profits market their products and services through the effective use of online tools including websites, blogs, email, social networking, Google, S.E.O., YouTube, and more.Brian Basilico has built a reputation for creativity, innovation, and translating “geek speak” into English. Brian is also an adjunct professor, trainer, speaker, and author of many marketing and social networking blogs and articles. Caleb Breakey is CEO of Speak It To Book, a digital ghostwriting agency. We talk about how coaches can know if they are ready to write a book, why you should consider giving your book away for free, why Caleb thinks books are the "Swiss Army knife" of Marketing, the 7 key ways to be persuasive in every chapter of your book and how to build relationships to sell more of your products and services. Jennifer Urezzio is the founder of Soul Language and a master intuitive who uses her intuitive skills to help raise consciousness. Soul Language is a paradigm to put tangibility to Soul. She is the author of two books (available on Amazon): Soul Language Consciously Connecting To Your Soul for Success and A Little Book of Prayers. Jennifer Urezzio is a master intuitive, author, teacher and speaker. She specializes in helping people connect – to themselves, to each other, and to the Divine. She founded a new paradigm, Soul Language, which provides guidance for understanding our true nature and tools for accessing deeper levels of awareness. This new insight into how the Soul expresses itself is being embraced by top healers, lifestyle coaches, and CEOs all over the world as a method for helping people recognize their purpose and live from a place of power and truth. Bethanie Nonami helps people grow and scale their businesses by giving you access to your data and understanding the why behind your customers, leads and sales. Bethanie's insight changes the way you sell. When you understand why your customers buy, or equally important, don’t buy, the game changes. You are now armed with the secret sauce to help you elevate your brand and your earnings without working double time. She's also an avid reader (and Audible & podcast listener), movie goer, foodie and loves super fast & loud cars. Stan Way is the founder of PeakSalesResults.com. He is a highly sought after sales coach and keynote speaker. After years of working as a corporate sales trainer with multiple FORTUNE 100 and FORTUNE 500 companies Stan founded Peak Sales Results with the goal of empowering salespeople to sell with a servant's heart. Stan's personal coaching and training have created over a dozen millionaires in the past two years and in the past 18 months alone he has built four companies to multiple six-figures per month in sales using his scientifically based sales processes.Despite his business accomplishments he is most proud of being a father and is glad to call Birmingham, Alabama home with his family. You might mistake my guest today for Superwoman and if you do, you won't be alone. But Alissa believes YOU have Superpowers too! Alissa Daire Nelson is regularly featured on television news segments, inside major blogs and publications, and on podcasts from all over the globe. She's an accomplished Success Coach, Speaker, host of the Maximize Your Strengths podcast, as well as published Author of the hot new book; From Frustrated to Frickin' Awesome: 4 Steps to Achieve the Success You're Wired For. But more than anything else she's an exceedingly proud wife and mother of two, who loves helping others discover how to make their businesses and relationships thrive in harmony. Phil Singleton is a web designer, an SEO expert, and an award-winning author. Since 2005 Phil has owned and operated a digital agency based in Kansas City. In 2016 Phil and John Jantsch of Duct Tape Marketing co-wrote SEO for Growth: The Ultimate Guide for Marketers, Web Designers, and Entrepreneurs. SEO for Growth is an Amazon bestseller and has been listed as a top marketing book by Mashable, Oracle, and the Huffington Post. It's also been featured on MSNBC, Entrepreneur and Search Engine Journal as well as many other industry websites. David Roylance is the UK’s No 1 female focus voice and body language specialist. Typically his clients will be women in senior roles in large corporations who often come to him with a similar story. “I’m confident and I am strong” they say “So how come when I open my mouth in those big meetings, 10 seconds later I am wondering if anyone can see me or hear me.” What they get from working with David are the secrets of how you take charge of how your voice and body resonate so you can show up and shine. Where he has an excellent track record is helping women get themselves promoted and achieve significant pay rises. Lauren Midgley, a business strategist, bestselling author and powerhouse professional speaker, started her company Lauren Midgley Consulting in 2010, after a 25 year career with two Fortune 500 companies. She is a long-time observer of why some people are successful and others are not. Productivity, self-discipline and accountability play a huge part in getting results. She works with high achieving individuals to focus on exactly what needs to happen next to get results in their personal and professional life. The focus is on basic business principles, systems, productivity, performance factors and profits to get results. Her third book became an Amazon best seller: It’s 6 a.m and I’m Already Behind – Strategies to Get Caught Up. Lauren lives in Dallas – Ft Worth, TX. Chris Gardener is co-founder of Strategic Mentors, that helps people become more successful and less busy in their business so they have lives that others want.He’s also co-founder of Gift of a Future, a non-profit providing education to girls in Uganda, that breaks their cycle of poverty in a single generation.His mission is to help at least 1000 business owners to have what he calls the 3 F's - financial security, freedom and fulfillment - so they are then invited to collaborate in creating £20 million of social impact around the world each year. 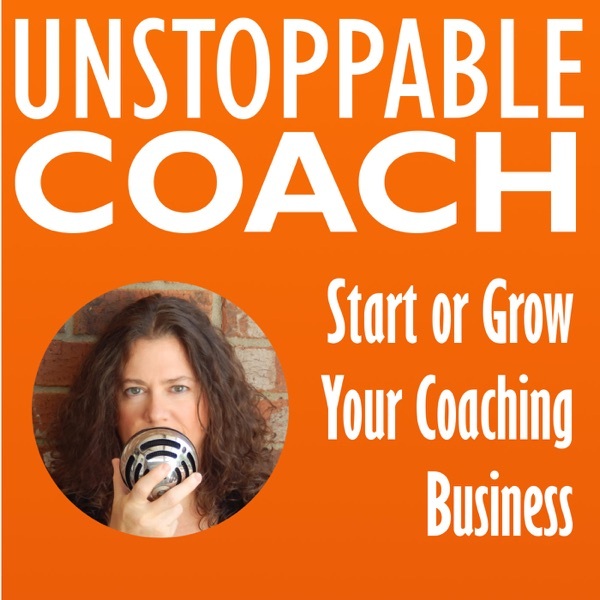 In episode 100 we go through the top 10 ways to grow your coaching business from the successful coaches that have been featured on the Unstoppable Coach podcast. Season 1 ends and I'm making a couple of exciting announcements. Season 2 begins 01-01-18. Join us for more coaches, more value, and more ideas on how to start or grow your coaching business. Briana E. Riggins is an author, speaker, and Visionary Coach. She assists women in making a way when it feels like there is NO WAY. She centers her work on helping women rebuild their foundation to move forward, re-establish their faith as the cornerstone of their lives, vision and success while redesigning their futures so they can turn their vision into reality. She is a Woman, Wife, Warrior, and Winner and so is Every Woman!!! Sharon Bolt is a publicity expert and the founder of Get Free Publicity Today. She's been a business owner and entrepreneur for over sixteen years now. During the last ten years, she's contributed to more than forty different local and national newspapers, magazines, television, and radio shows. She's received over two million dollars in free publicity and free advertising. She's also the co-author of two books: Successful Women in Business and Every Entrepreneur's Guide: Running Your Own Business. Athina Bailey is an online international business and mindset coach for spiritual entrepreneurs She's also a speaker and author. She originally set up an alternative therapy school and realized her passion lies in helping other spiritual practitioners and coaches grow their businesses. She studied many modalities including hypnotherapy, NLP, EFT, kinesiology, Reiki and more. She currently teaches Reiki and energy healing all around Australia and speaks regularly at events for practitioners, coaches, and entrepreneurs. Jess Todtfeld is President of Success In Media, Inc, one of the leading business communication and media training authorities in the U.S. With more than 15 years of experience, he helps CEOs, business executives, spokespeople, public relations representatives, experts, and authors to not just become better communicators, but create real tangible outcomes. His talks begin with one simple question…“What Are You Trying to Create More of?” Jess has trained clients from the United Nations, IBM, JPMorgan, AARP, USA Today, The World Children’s Wellness Foundation, Land Rover USA, Edelman Public Relations, LinkedIn, The American College of Emergency Room Physicians, Scripps TV Networks, North Face apparel, and the ASPCA. Jess brings with him 13 years of experience as a Television Producer on the National Level for networks including NBC, ABC, and FOX. During that time he booked and produced over 5,000 segments. On the other side of the camera, Jess has hosted, reported, and even earned a Guinness Record as a guest… Record for Most Interviews Given in a 24 Hour Period. Chrysta Bairre is a career coach, speaker, upcoming author, and founder of Live Love Work. Chrysta works with successful mid-career professionals and service-based entrepreneurs who want more from life and career. Chrysta helps her clients increase professional impact and income-- working with them to love their work, be well-paid, and find happiness in and out of the office. Chrysta has spoken at multiple Ignite events across Colorado, presented at Fort Collins Startup Week, Colorado State University, and many other local businesses and community organizations. Chrysta is a 2015 recipient of the Top 20 Classy Career Girls from Classy Career Girl dot com, and a 2016 and 2017 participant and facilitator of Larimer County Women of the Year. Pamela Wagner dedicates her time to helping businesses around the world grow sustainably through paid ads - with the majority being Google Ads. The former Google employee was recently named Forbes 30 Under 30 and her company is also an official Google Partner. Having worked with more than 2000 companies worldwide as well as managed a total of $3million+ advertising spend, she offers a unique expertise in a sea of many fish. Kim Lambert is a Travel Writer, Speaker, Photographer, Writing and Publishing Strategist and Coach, a more than twenty times Amazon Number One Bestselling Author, of more than 35 books to date (fiction under pen names). She owns Dreamstone Publishing which designs, edits, formats and publishes books for authors. She mentors business owners to boost their authority, assisting them with creating books that produce the optimal results for their business. Kim is the creator of the Zero to Book 3 day writing course.